Do you put everything on a card? It’s easy, convenient and quick but is it good for your budget? Paying in cash may seem outdated but it just might save you a small fortune. When I’m helping clients to get their budgets under control one of my first suggestions is to start paying in cash for things. I’m not talking about avoiding credit cards (although that is also a good idea), I’m talking about avoiding using a card at all and paying in cash. Now this isn’t feasible for all transactions but for most “discretionary” spending you can use cash. My budgeting philosophy is to automate as much as possible and everything that you haven’t automated you could be paying in cash. I personally choose to only pay in cash for my “spending money” each week as I have become very good at monitoring groceries and petrol expenses, but for the newbie, paying in cash for these three expenses is a good idea. While pulling out the card (particularly the credit card) is super easy, psychologically it isn’t the same as handing over hard cold cash! It is much easier to watch your budgeted cash disappearing than to track a card where you likely won’t notice the money is gone until your transaction is rejected or a big nasty credit card bill arrives. If you have trouble keeping track of your spending and sticking to your weekly budget I would really recommend you try paying in cash for a couple of weeks. 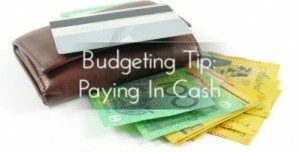 Start by withdrawing the cash for the amount you budget for spending money each week. Now when you go to buy a coffee or that new pair of jeans pull out the cash and hand it over! Paying in cash gives you a visual reminder of what you have spent and what is left. When the cash is gone, that’s it. No more spending!! You may be surprised at how often you are dipping into your wallet and how quickly that $50 note disappears. Share your budgeting tips in the comments below.